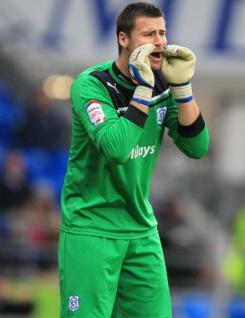 David Marshall is an experienced goalkeeper who joined Cardiff City during the 2009 close season following Norwich City?s relegation to League One. A solid unflappable ?keeper he immediately became the club?s first choice and was a near ever-present in 2009-10. He retained the jersey for the opening weeks of the 2010-11 campaign, but at the end of September he lost out to Tom Heaton and thereafter he made only a handful further appearances. &nbsp;David began his career with Celtic, where he produced a memorable UEFA Cup performance against Barcelona in the 2003-04 campaign and later that season gained a Scottish Cup winners? medal before switching to the Canaries in the summer of 2007.